Yesterday was a rain-out. Several of us attended Russell's judgement seminar, but the weather just didn't clear up. So I headed back this morning with Joyce and Lance. The sky was very blue and there were some nice puffy clouds over the hills. It looked to be a good soaring day. Darren, Lance, and I worked on getting 2BA and 9JH ready. I was to fly 2BA (pictured on the right) and Lance was going to take 9JH. After I got things situated, Brett came over and we talked about the glider, looked over the cockpit, and got met settled inside. After adjusting things a bit, I got a parachute on and settled in for real. While I was getting comfortable, Lance launched along with a bunch of other guys. 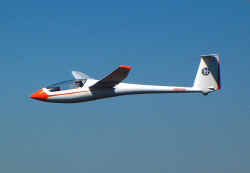 Several of the private glider owners came out to fly: Brian (DG3), Peter (2T), Hugo (8L), and even Dr. Jack. Sadly, none of them had found much lift. I launched shortly after Lance landed. For my first flight, I towed behind the Pawnee on runway 24. The first 10 seconds of the tow were a bit tense, but I just tried not to do anything dramatic. I was in the air in no time. I kept finding myself a bit low on tow, so I adjusted the trim a bit after we got above 1,000 feet and it made all the difference. We towed to 5,200 feet and then I hopped off tow to get acquainted with the glider. I spent time getting used to the speed control, trim, and noise levels. Then I remembered to retract the gear, tried some slow flight, turns, and generally just played around since there wasn't any lift to be found. I had set a rule for myself that I'd lower the gear at 2,000 feet whether or not I was in lift. Not long after, I entered the pattern for runway 31 and landed. I landed a bit shorter than I wanted (I seem to always do that on 31) and had a very minor bounce. I managed to roll the glider all the way to the normal stopping area but couldn't quite get it off the runway. The rudder just isn't as effective at low speeds on the Pegasus. I launched again off 31 a few minutes later for my second flight. This time I towed to 4,700 for more of the same. I remembered to retract the gear a bit sooner and had fun with figuring out how fast I could get the glider to roll. I planned to land 31 again, but a plane on the ground asked if I could switch to 24 to let some planes take off on 31. I could see at least three of them backed up and 24 was open, so I switched. My second landing was better--no bounce. Nice and smooth. However, I again didn't hit the rudder early enough and couldn't quite get off the runway. I took a break while others landed and decided to go up for a third, shorter flight. 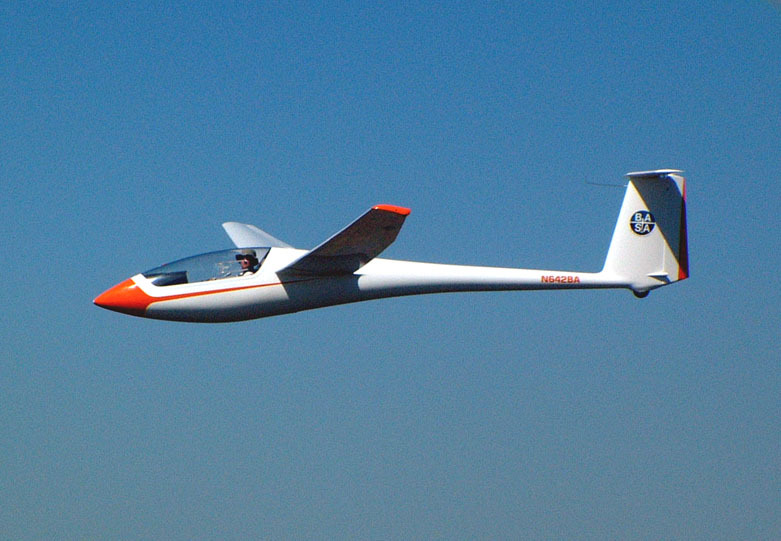 As I was pushing the glider back onto the taxiway, Lance called on the radio to report that he was in lift. I launched just after he landed (again) and went looking for lift under the nearby clouds. While I didn't find much lift, I did manage to find some zero sink areas. Before long, it was time to land. Again, I landed on runway 24 and this time was able to control my path better (earlier). I rolled off the runway and stopped just where I wanted to.